Experience two amazing journeys at one price, with a Northern Lights adventure, Norway's fjords and an optional dog sledding trip. This beautiful trip combines the popular Norway in a nutshell® trip with the Northern Lights adventure. You will experience the mountains and fjords with the Bergen and Flåm Railway, the Aurlandsfjord and Nærøyfjord. After a day in Bergen the journey takes you further north, to Tromsø and Arctic Norway, with adventurous activities as dog sledding and snowmobile safari. Tromsø is a lively and beautiful city packed with culture and history and surrounded by mountains, fjords and islands. The town is among the best places to observe the northern lights or experience a northern lights safari. 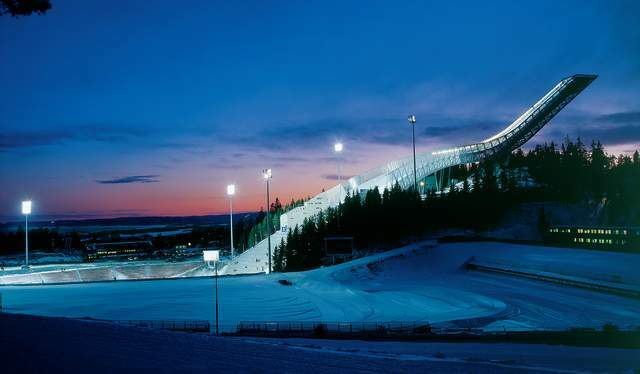 Nightly visits to northern light camps along with activities such as dog sledding and snowmobile rides are popular in the Tromsø area in winter. This round trip is the most popular round trip in Norway. It takes you on a journey through some of the most beautiful scenery in Fjord Norway, and includes breathtaking experiences on the Bergen Railway, the Flåm Railway, the Aurlandsfjord, the Nærøyfjord and the steep Stalheimskleiva road (May to September). The Opera House is among the most visited attractions in Oslo. Enjoy opera, ballet, guided tours and fine dining in the new Opera House. A visit to Oslo is a good opportunity to learn more about the Vikings and their culture, and the famous Holmenkollen is one of the most visited tourist attractions in Norway. Tip: See the documentary about the northern lights in the museum. Hotels in Norway come in all shapes, sizes and personalities. From budget to luxury, there are hundreds of Fjord Pass® hotels to choose from around the country. Bergen is an international city with lots of history and tradition, small-town charm and atmosphere. Bryggen, Bergen&apos;s historic wharf, and the city&apos;s architecture with the surrounding fjords and hills make it a picturesque destination addition to being a designated UNESCO World Heritage Site.